The hard-working Columbia Bahama II men’s long-sleeve shirt assists in keeping you comfortable long after you’ve brought in your limit. 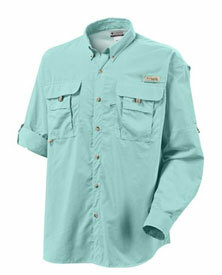 Designed specifically for the needs of anglers, the shirt is made of a lightweight, durable nylon fabric that dries fast must you get splashed. The mesh-lined cape vents at the back shoulder, meanwhile, support the airflow, helping keep you cool in the freshest conditions. After all, the shirt offers built-in Omni-Shade UV protection that assists in keeping the sun off your back until you are ready to come inside. Other features include two big chest pockets that offer a lot of room for small gear, button tabs for rolling up and securing the long sleeves, and your choice of several sizes and colors. 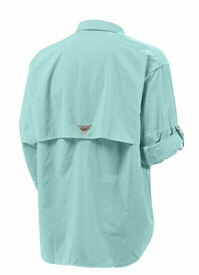 The Bahama II long-sleeve shirt includes mesh-lined cape vents at the shoulder to support the airflow. Columbia’s Omni-Shade clothing protects you from damaging UV radiation by blocking the majority of the sun’s harmful rays, letting you stay out longer on sunny days. Unlike SPF (Sun Protection Factor)–which is a measure of sunburn reduction from sunblock and protects you from UVA rays–Columbia’s Omni-Shade products are far more versatile, combining a tight-weave construction, UV reflectors, and UV absorbing technology. These features not only prevent sunburns and long-term skin damage, but they also give protection to the wearer from UVB rays along with UVA rays. UVB rays are a lot more harmful than UVA, and are present even on cloudy days. Plus, Omni-Shade doesn’t wear off. As a substitute, your safety increases as the Ultraviolet Protection Factor (UPF) increases. Several layers of Omni-Shade protection are to be had: UPF 15, UPF 30, UPF 40, and UPF 50-plus. It’s like sunscreen, but you should not have to reapply. All Omni-Shade fabric carries the Skin Cancer Foundation’s Seal of Recommendation, which is given to sun-protective fabrics that have a minimum UPF of 30. Founded in 1938, Columbia Sportswear Company has grown from a small circle of relatives-owned hat distributor to probably the most world’s largest outerwear brands and the leading seller of skiwear in america. Columbia’s extensive product line includes all kinds of outerwear, sportswear, rugged footwear and accessories. Columbia makes a speciality of developing innovative products that are functional yet stylish and offer great value. Eighty-year-old matriarch Gert Boyle, Chairman of the Board, and her son, Tim Boyle, President and CEO, lead the company. Columbia’s history starts with Gert’s parents, Paul and Marie Lamfrom, when they fled Germany in 1937. They bought a small hat distributorship in Portland, Oregon, and named it Columbia Hat Company, after the river bordering the city. Soon frustrated by poor deliveries from suppliers, the Lamfroms made up our minds to start manufacturing products themselves. In 1948, Gert married college sweetheart Neal Boyle, who joined the circle of relatives business and later took the helm of the growing company. When Neal all at once died of a heart attack in 1970, Gert enlisted lend a hand from Tim, then a college senior. After that it wasn’t long before business in reality started to take off. Columbia was once probably the most first companies to make jackets from waterproof/breathable fabric. They introduced the breakthrough technology referred to as the Columbia Interchange System, in which a shell and liner combine for more than one wearing options. In the early 1980s, then 60 year-old Gert started her role as “Mother Boyle” in Columbia’s successful and popular advertising campaign. The company went public in 1998 and moved into a new era as a world leader in the active outside apparel industry. Today, Columbia Sportswear employs more than 1,800 people world wide and distributes and sells products in more than 50 countries and to more than 12,000 retailers the world over.